A digital data sheet contains different sections; at least a technical section and annotations section for humans. 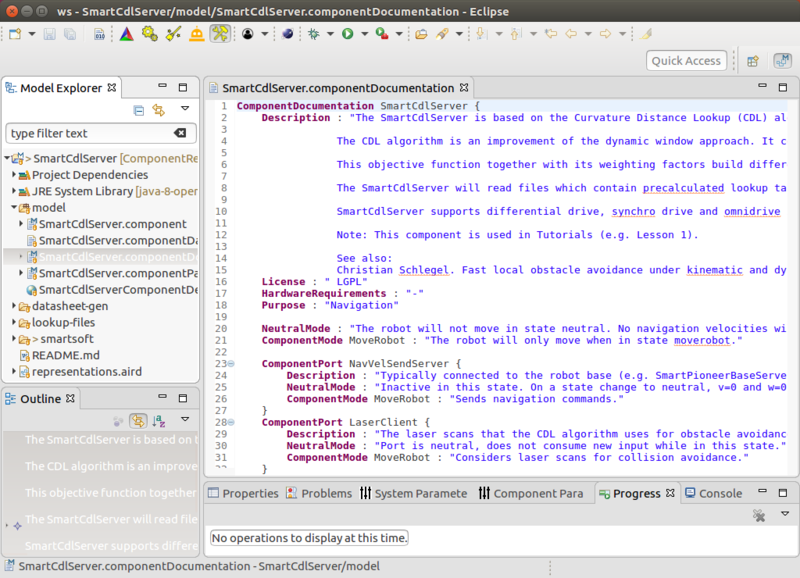 The SmartMDSD Toolchain supports the technical digital data sheet via its models. It support via annotations is currently distributed over several places as this technology is currently in migration. The concept is illustrated in the figure below [Stampfer2018]: The technical (component) model and the non-technical annotations together provide information for dedicated use-cases. Note that “data sheet model” and “documentation model/DSL” are used as synonyms here. The figure below illustrates it for documentation for humans. The RDF example below illustrates it for import in a triple-store for semantic search. Another example is the interaction with other tools via the digital data sheet (see the interaction between SmartMDSD Toolchain and Groot). Your menu wizard should look as shown in the screenshot on the right. Please note that the ComponentDocumentation DSL is considered depricated and its features are currently being migrated to the Digital Datasheet Model (see next section). These DSLs are by themselves kept slim as they focus on describing non-technical metadata of the respective project and at the same time collect technical documentation directly from the respective technical models. As an example we will provide technical documentation for the CommJoystick communication object (see the following screenshot). 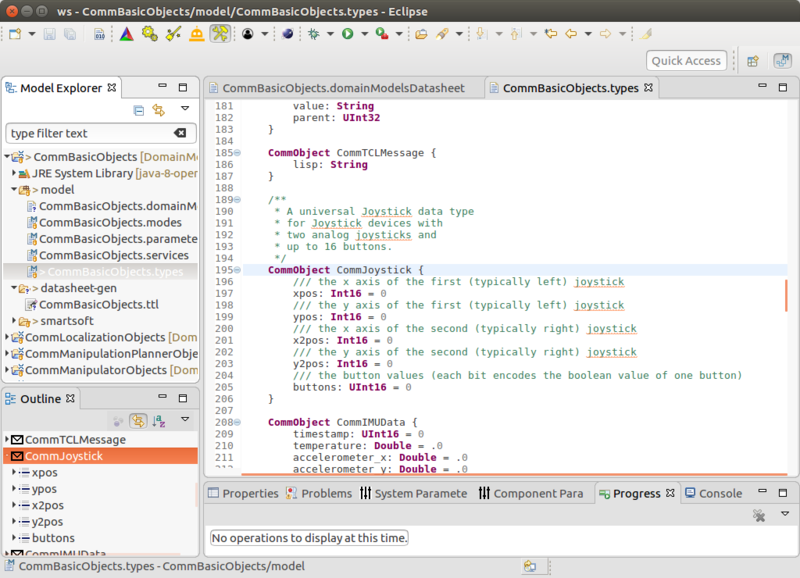 As shown in the screenshot above, you can document your model elements using a Javadoc-like syntax. Please note, that these comments are not only local comments, instead they are later collected from the respective Datasheed model to generate different Datasheet representations such as e.g. the RDF/TTL for importing in semantic triple-stores (as shown below). Your menu wizzard should look as shown in the screenshot on the right. You can now provide the non-technical information such as e.g. the used License in this model file. As soon as you save the model, it will collect all the technical information from related models and non-technical information and generate the supported Datasheet types. At the moment we already support the RDF/TTL syntax for importing in semantic triple-stores. An example is shown in the screenshot below. Please note, that the previously defined comments from the CommJoystick are also reflected in the generated Datasheet syntax. 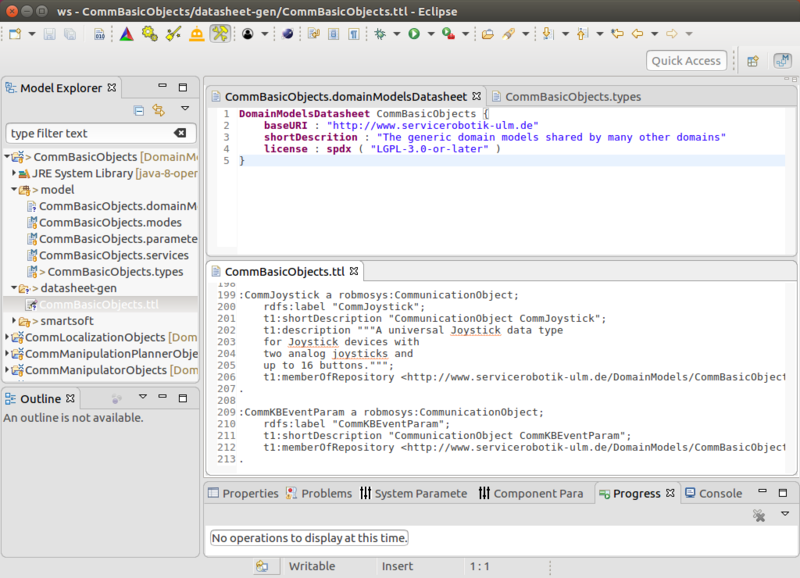 The documentation of the Component model works analogously to the DomainModels, with the only difference of the Datasheet file extension which is .componentDatasheet. Please note, that the Datasheet feature will someday entirely replace the former “ComponentDocumentation” DSL (see above section).